"The Best Seat In The House!" Join in the Game of Musical Chairs! We invite you to network & learn their secrets to success. Have a chance to win a Portable Clarin Seat with a Patriots, Red Sox or Sea Dogs logo! The Institute continues our second in a new series called the "Family Business Spotlight." Each quarter we feature a family business that has had a long relationship with the Institute and has a deep commitment to supporting family-owned businesses in Maine. 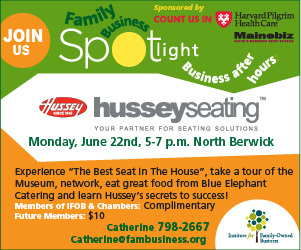 Tour the Hussey Seating Company Museum, experience the Hussey Seating Product Showroom first-hand and have a chance to win a Portable Clarin Seat in a round of musical chairs! Meet their employees and hear from the family about the challenges and successes of running a family business. Enjoy great food from Blue Elephant a boutique family-owned catering company that creates unique and memorable designer events and weddings.